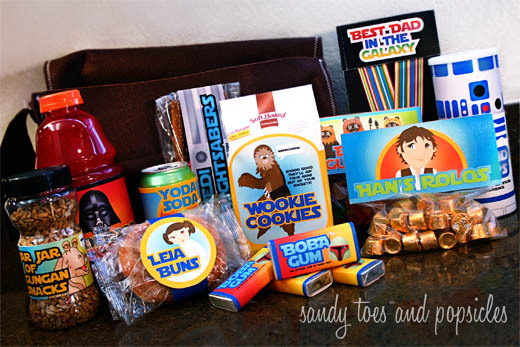 so….as promised on my post i wrote here yesterday i said i would post the printables to make you own Daddy Star Wars Kit. well, i got the link up, so here it is. of course you can pick and choose which items you would like to make. you don’t have to make all of them. plus, these would also be fun for a party as well.the messenger bag tutorial will be on the next post. Thank you so much for your kit. My kids just used it to send it to their dad who is deployed! They had so much fun doing it and we are certain it is going to be appreciated! If anyone wants to send it via mail, we emptied the vaterade and filled the bottle with individual dry Gatorade powder packs. And the yoga soda was emptied… You could use it on a soda can sleeve as well. You are AMAZING! Thank you SO much for sharing your labels! 🙂 We are having a 6 year old Star Wars’ birthday party and can NOT wait to use them. Seriously….you are FANTASTIC! LOVE IT – LOVE IT – LOVE IT!!!! !